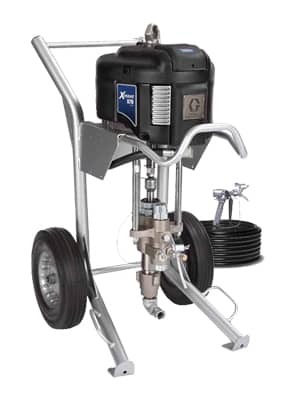 Airless Spray Pumps - Airless Paint Sprayer Equipment | Spray Quip, Inc.
Spray Quip stocks a full line of airless & air-assisted spray pumps which propel your coating materials using pressure provided from a hydraulic pump. These processes dramatically increase the pressure and speed of your spray on coatings. This increases productivity and efficiency of materials while combining airless automation speed with the consistently fine finish of air spray. Our airless paint sprayers have component mechanical and electronic proportioning systems to handle Mix Ratios from 1:1 up to 30:1 by volume. Most common uses for airless spray pumps are for either household or industrial painting or finishing needs using latex or oil based products. We offer manual and automatic airless spray guns (applicators), pumping systems and accessories from trusted brands like Graco, Binks, Nordson, Titan/Speeflo and WIWA. At Spray-Quip, we provide and commission airless spray equipment, such as Graco’s Xtreme air assisted spray system, for almost every application, including finish and coating applications that requires high production levels and a relatively smooth finish in order to provide a high level of corrosion control on roof coatings, epoxy components, fabricated metal parts, pipe and tank coatings, or protective coatings on bridges.